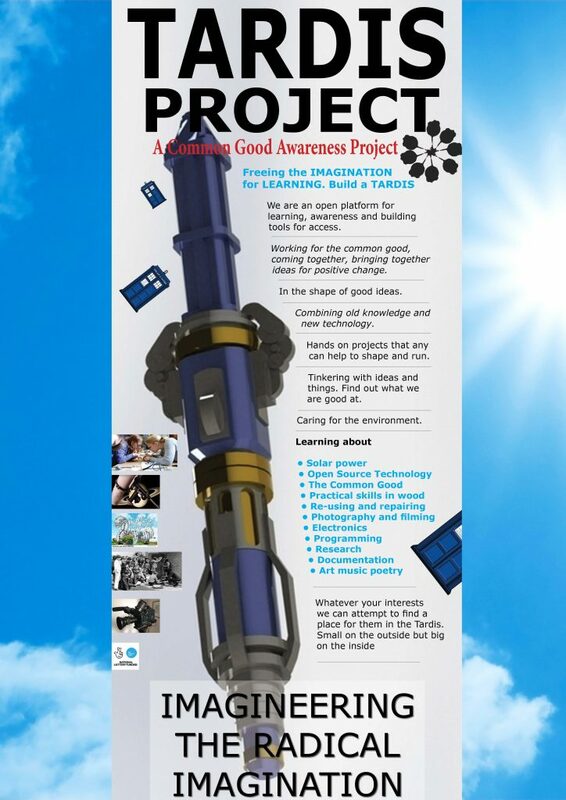 The Common Good Awareness Project, prioritises helping folk to understand what they have freely available to them. From Public owned assets and places, to Open Source computing. We make videos to explain these things, run workshops, support community groups and educate people about technology through creativity. At present we are running a laptop challenge, collecting older computers and installing them with Open Source operating systems and giving them away to anyone who needs them for free. architecture as a social subject, walks, talks, and events. We try to work with people around their own interests and experiences in the learning process. Most of this work is self funded and supported by goodwill where we find it. The summer project will combine the thinking, with the practical and the physical. The Tardis Project, will consist of building a Dr Who type Tardis. After we build it, emanating from it will be a variety of activities that will range from performance, music, arts, as well as (Low voltage) electronic and computer projects that will enhance computer literacy and the understanding of technology. The building and installation of the pod and what is in it will be arrived at through workshops at Kinning Park Complex and other community places. Once the solar powered Tardis is completed we will then time travel through the community and beyond and do workshops, events at different spaces; in the park, the town square, the market, shopping centre, school or wherever we land. When the summer project finishes the Tardis could be lent out to groups schools, or community centres to use for education and fun purposes. It could also be used for example as a recording booth at the local shopping centre to let folk record their stories for our community archives. After the summer, all materials and information collected will become a community common good asset. Although most of the activities will be centred around Kinning Park Complex, some of the work will be carried out in Castlemilk, Possil and at our container workshop. This is a strong element of our work, that we in our travels, connect to as wide geographical area and experiences as possible. As well as age groups and a wide variety of interests. This work will help us to connect to future work, people and ideas in encouraging the principals of community empowerment and the commons. We will engage workshop leaders from the local community when we can, as keeping the skills and experiences local is important to us. The project will be run as an education tool from the planning stages to the execution of the work. The important part of the project, for the group itself, is how well the community participants take ownership of the project through their involvement.